The half scarf is too long now to fit entirely on my improvised blocking wires (a pair of 14 inch long, US size 4 (3.5mm))knitting needles—and stretched out like this the ribbing looses all of its natural tendency to corrugate--but it does, and when it does eventually get block, the ribbed portion won't be blocked at all--and will naturally scrunch up. 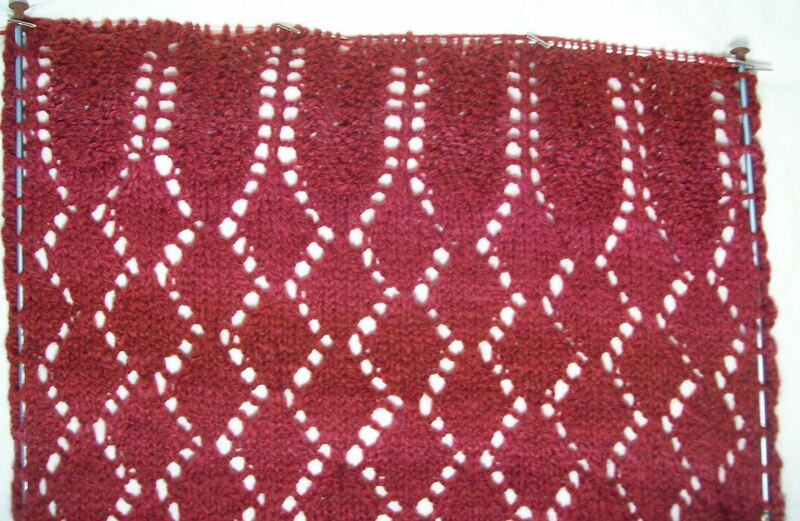 This style of scarf is in the air—Evelyn (aka Lost the Thread--Oct 10th entry) has just completed a very similar scarf—a different lace pattern (but it's sort of diamonds) a different rib pattern at the back of the neck (but its still ribbing) different yarn (but a super soft one! ), different color (how pretty it looks in white!) --everything is different—but its also very clearly the same sort of scarf! I'll do some more work on this scarf later today (well, this evening) but this afternoon I am going to do some work on my skirt—I want to have it finished (and ready to wear!) this weekend. I'll wear my new Ragg Effect socks at the same time—a treat to myself for doing so well with my weight lose. I have everything I need—a zipper, some skirt hooks for the closure—all I need to do is sit down and finish it. And I've had a great idea that is going to have me working double time—for now a bit of secret project--(a big one!) but I can do it. It involves a lot of extra knitting—and even more time consuming—lots of extra documentation! But I am committed. I don't think I'll finish the scarf tonight—but it will be done this week—this has been a fast project!